Are you looking for Women's Leather Chaps? Well, we hope you are because the reality is that you have found our Women's Leather Chaps page. Going for a ride? Make sure you have your chaps ready. Apparel Search is a leading guide to fashion, style, clothing, glam and all things relevant to apparel. We hope that you find this Women's Leather Chaps page to be helpful. What are women's chaps? 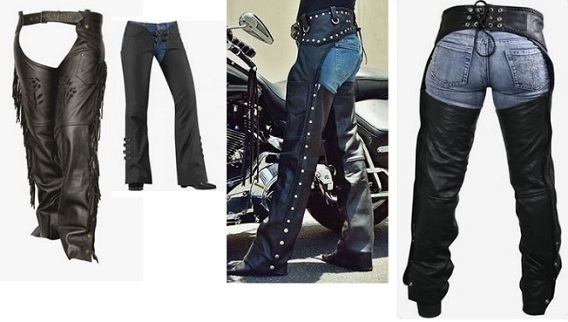 Chaps are leather pants without a seat, worn by a cowgirl over ordinary pants to protect the legs. They are sturdy coverings for the legs consisting of leggings and a belt. Chaps are very often made of leather. They are most typically worn while horseback riding or riding a motorcycle. Chaps are also popular in fetish fashion and the leather subculture, where they often are tightly fitted and worn without jeans or other garments layered beneath them other than a codpiece. They can be made of leather, patent leather, rubber, or vinyl and are worn for decoration serving no protective purpose. Shotgun chaps - sometimes called "stovepipes", were so named because the legs are straight and narrow. Batwing chaps - are cut wide with a flare at the bottom. Generally made of smooth leather, they have only two or three fasteners around the thigh, thus allowing great freedom of movement for the lower leg. This is helpful when riding very actively, and makes it easier to mount the horse or motorcycle. Chinks - are half-length chaps that stop two to four inches (5 to 10 cm) below the knee, with very long fringe at the bottom and along the sides. They are usually fringed along the outside edge and bottom, making their apparent length appear about 4 inches (10 cm) longer. The leg shape is cut somewhere between batwings and shotguns, and each leg usually has only two fasteners, high on the thigh. They are cooler to wear and hence a design that is suitable for very warm climates. 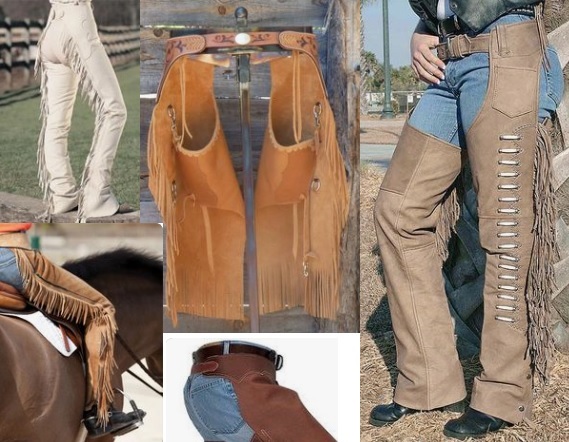 Armitas - are an early style of chaps, developed by the Spanish in colonial Mexico and became associated with the "buckaroos" or vaqueros of the Great Basin area of what is now the United States. They are a short legging with completely closed legs that have to be put on in a manner similar to pants. They are sometimes a bit longer than chinks, but still stopping above the top of the boot, fringed on the sides and on the bottom to reach the boot tops, attached by a fringed belt. Woolies - are a variation on shotgun chaps, made with a fleece or with hair-on cowhide, often angora, lined with canvas on the inside. They are the warmest chaps, associated with the northern plains and Rocky Mountains. Half chaps - Half chaps, also known as chapettes, are a popular style of equestrian gaiters that extend from the ankle to just below the knee. When worn over a short paddock boot they give the protection and some of the appearance of a tall riding boot, but at lower cost. Zamorros - somewhat resemble batwing chaps, in that the leggings are closely fitted at the thigh and flare out below the knee, but unlike batwings, the leggings extend far below the boot with a distinctive triangular flare. Zamorros are commonly made of cowhide, either plain tanned leather or hides with the hair on. Chainsaw chaps (we suggest Kevlar instead of leather). Biker leather chaps for women for added protection from the road, wind and elements. Leather is a material made from the skin of an animal by tanning or a similar process. Learn about the various types of leather grain that can be used for women's chaps. Leather is a natural durable and flexible material created by tanning animal rawhides and skins. How did chaps get their name? Their name is a shortened version of the Spanish word "chaparreras." Chaparreras were named after the chaparral (thick, thorny, low brush) from which they were designed to protect the legs while riding on horseback. If you want to be even more stylish, you should wear your favorite women's leather chaps. Learn more about Women's Fashion.